I am migrating this blog to its own domain. Furthermore, I am using jekyll to turn this into a static site. You can view the source code for the blog here. I have long wanted to do this. In fact I had written earlier about migrating to Octopress, but had held back. I'm glad to be making the switch finally. I will retain the existing posts in this blog but will no longer publish new posts here. Please join me on the new blog for latest posts. The first two posts have looked at the topic taking ViewPager as an example. I have also mentioned repeatedly that this is not the only use case for having to maintain the back-stack of nested fragments. One use case that I threw up often in comments was about Navigation Drawers. That is exactly what this post will look into. EDIT: Some Google engineers, including the creators of the Android framework have expressed their reservations regarding this article. Read this G+ thread for more details. They point out that using an Application sub-class to save state is not a good idea, but also that saving Fragment instance state explicitly might in itself needs to be considered carefully. I hope to gather their thoughts and write a follow-up post in the coming weeks. Stay Tuned. Consider pro-actively saving your Fragment states in onPause, particularly is the Fragment happens to nest other fragments inside of it. Do not rely solely on the system saving state for you in onSaveInstanceState. Use FragmentManager#saveFragmentInstanceState to save the Fragment state including the back-stack of nested fragment transactions for you. Do not hold on to the saved state any longer than necessary. If you take the source code for Part 2 of the series, and adapt it as-is to a Navigation Drawer example, you’ll find that things don’t quite work as you’d expect. In particular, you’ll find that even though you have saved the state of the ContainerFragment in onPause, the next time you return to this fragment, its state is cleared. Why is this? The alert reader might have spotted the reason. In the case of the ViewPager example, we clear the saved fragment state in onDestroy(). This is because of the way ViewPager works (or rather, FragmentPagerAdapter or FragmentStatePagerAdapter works): When you navigate away from a tab, the Fragment’s `onPause is called but none of the other life-cycle methods are called. This means onDestroy is skipped and the Fragment is simply torn down. onDestroy is only called when the hosting Activity is destroyed. However, when you use a Navigation Drawer, the case is different. In this situation, there is no PagerAdapter to deal with. When you navigate from one item in the navigation drawer to another, the “old” Fragment undergoes the complete life-cycle - onPause all the way to onDestroy and onDetach. As a consequence, since you’re clearing the saved Fragment state in onDestroy of the ContainerFragment, you end up clearing the state that you had just saved in onPause. Well, the solution is rather simple - just don’t clear the state in onDestroy of the parent Fragment! In addition, there are a few other minor changes - like the way you set the initial state of the ContainerFragment (instead of retrieving the saved state in one of the life cycle methods of the Fragment, you use setInitialSavedState in the static creator method). The source code for this is available at the github repo for this series. The bullet points that we established in the previous post (re-capped at the beginning of this post) say that you should not hold on to the saved state any longer than necessary. However, we had to violate that rule in this solution because - well - it is pointless to save the state only to immediately clear it! However, depending on your use case you might approach this in a different manner. For example, you might only clear the fragment saved state when the hosting Activity is destroyed. This is not demonstrated in the sample code on github but should be straightforward to implement. This article is the second in this series about Nested Fragments and the Back Stack in Android. You can read Part 1 here. To get this post into context, take a look at the video embedded in the previous post, if nothing else. A Fragment’s onSaveInstanceState method is not guaranteed to be called when it is “removed”. The Fragment might simply be torn down. The only time its state might be saved is when the hosting Activity saves its state. We also saw how this could be a problem when you use nested fragments and a FragmentManager doesn’t save its backstack of fragment transactions. In this part, we’ll look at one possible solution to this problem. This is the obvious solution to the problem. The Android docs also state this time and again: it is a best practice to proactively save state. Also, since onPause is the only callback that is guaranteed to be called, it makes sense to save your instance state here. Having said that, it is easy to save view states, scroll positions and even entire arbitrary objects in onPause. But, how does one save a back stack of fragment transactions? Enter Fragment.SavedState. You can ask the FragmentManager to save the state of a Fragment using saveFragmentInstanceState. The back stack being managed by a Fragment’s nested FragmentManager is included in the state saved by this method. This post shows how you could use a sub-class of the Application class to save the state, but you might choose another mechanism to do so. The important thing is that the state has to be saved. We use a Map of strings as keys and the saved state as values in this example. The instance state saved in onSaveInstanceState, which is provided to you by the system via savedInstanceState. The state you explicitly saved in onPause, which you retrieve from the Application object as fragmentSavedState. You first check to see if you had previously explicitly saved state. If true, then you don’t need to do anything. If not, then you proceed to check if the system had saved state for you. If true, then you use the savedInstanceState to restore system-saved state. Only if neither is true, then you initiate the fragment transaction. One thing you need to be careful of is to not hold on to the saved fragment state any longer than necessary. For example, when the container Fragment is destroyed, you want to invalidate the back-stack associated with it as well. This sounds obvious but I overlooked it and ended up with strange behaviors. With all these steps in place, the app now behaves as one would expect it to. Your position within a back-stack, even within a nested fragment, is remembered even when you navigate away and return to the top level fragment. The source code for the entire series is at github. This article looked at ActionBar tabs with a ViewPager, but this concept applies to other situations where one would use nested Fragments (Navigation Drawers for example). This article is not about the back stack of activities that Android maintains for every task. That stuff has been written about adequately elsewhere. This post is about the back stack of fragment transactions maintained by the FragmentManager and how they relate to nested fragments. Heads-up: If you are using nested fragments, you need to use the support library, even if your app only targets API level 14 and above. This is because nested fragment support was added in API 17, and the feature was back-ported to the support library (revision 11 and later). There are many situations where a fragment may be mostly torn down (such as when placed on the back stack with no UI showing), but its state will not be saved until its owning activity actually needs to save its state. This is from the docs (emphasis mine). Overlooking this can lead to bugs especially when you use nested fragments since the back stack of a child fragment manager could be reset when you least expect it. Remember - if the state of a Fragment is not saved, then by definition, the back stack of fragment transactions managed by that fragment’s child FragmentManager is not saved either. If you use ActionBar tabs, the content of each tab is implemented as a Fragment. Each “page” in a ViewPager is often implemented as a Fragment. In navigation drawers, the “content” of each navigation item is expected to be a Fragment. What this translates to is that what would once be implemented as an Activity now needs to be implemented as a Fragment. This also means that a flow within that Activity, that might have been implemented using Fragments, now needs to be implemented using nested Fragments. Note that by “flow” I simply mean a sequence of screens to establish a particular task. Now here’s the thing with flows: If a user “goes away” from a flow and later returns to it, it is expected that the user continues from the screen where they left off. Translated into Fragment terminology, this means that if a user navigates away and returns to a flow that is implemented using Fragments, its is expected that the user’s position in the backstack of fragment transactions is retained. However, this isn’t always the case. The content of the first tab has been modified to make it a “Container” Fragment that in turn contains two nested fragments. When the container fragment is first created, it shows a nested fragment asking you to enter your name. On entering the name and Clicking “Next”, you are presented with another nested fragment asking you to enter your GitHub username. The other two tabs are just simple Fragments - no nesting business there. Enter name, press Next. Then, enter a github username. Navigate to the tab titled “Section 2” and then back to “Section 1”. Navigate to the tab titled “Section 3” and then back to “Section 1”. Uh! In step 3 above, the back stack was nuked. But hey, it didn’t happen in Step 2. Why so? This example uses a ViewPager. By default, a ViewPager has an “off screen limit” of 1. This means that in addition to the page being displayed, one adjacent page in each direction is kept in memory. So, when you navigate to “Section 2”, everything in “Section 1” is still intact in memory. When you navigate to “Section 3”, the page corresponding to “Section 1” is torn down. More importantly, since at this point the Activity instance state is not being saved, the Fragment state isn’t saved either. This ties in with what we saw in the “TL;DR” section above. As a result, when you navigate back to “Section 1”, the nested fragment back stack is reset. Now you’ll see that the back stack is retained. This is because when you rotate the device or switch to another task, the Activity saves its instance state. As a consequence the container fragment does too. Re-iterating what we started off this post with, keep in mind when you are using nested fragments that a Fragment is guaranteed to save state only when the containing Activity saves its instance state. At other times, the Fragment might simply be torn down. The code for a sample app illustrating the problem is available at github. The next part of this series will explore ways to overcome this problem. Touch a single item to open it. Long-tap multiple items to choose them and perform a common action on them. Note that we wish both these to be possible simultaneously, i.e., even as one item is opened, we wish to allow multiple items (possibly including the item that is opened) to be chosen. This behavior (with some minor variations) is seen in apps like GMail, Google Play Store and the Google I/O 2013 app. Just to avoid confusion, let's sort of formalize the terminology related to the states an item in the list can be in. An item is opened when the user is viewing the details about that item. In other words, the details of that item are being displayed in the DetailFragment. In dual-pane mode, there needs to be some visual indication in the ListView to let the user know which one of the items is currently opened. When an item is chosen, the Contextual Action Bar appears and the user can perform some action on the item. When multiple items are chosen, only the contextual actions that apply to all of them are to be presented. There needs to be some visual indication in the ListView to let the user know which of the items are currently chosen. Needless to say, this indication needs to differ from the that used to indicate the opened item. You might notice that one can achieve the opened behavior using ListView's CHOICE_MODE_SINGLE and the chosen behavior using CHOICE_MODE_MULTIPLE_MODAL. However, it is while trying to combine them that things begin to get challenging, particularly in dual-pane mode. You get either one or the other, but never both. For example, if you use CHOICE_MODE_MULTIPLE_MODAL, then you lose the ability to visually indicate the currently opened item. In the getView() (or equivalent) method of your custom ListAdapter, examine the item at the supplied position. If it is the currently opened item, set its visual properties to indicate this. Ditto if it is one of the chosen items. Listen for clicks and long clicks on your ListView and update the adapter defined in step 1 accordingly- i.e., in your OnItemClickListener implementation, set the opened item and in OnItemLongClickListener, update the list of chosen items. OnItemLongClickListener is also where you need to start the action mode (getListView().startActionMode()) if it isn't started already. Here are relevant portions of the code showing how the Adapter should be customized. This code is sparsely commented since I hope that it is self explanatory. Please look at the end of this post for the link to the complete github project. At this point, we have set up the Adapter to keep track of the currently opened item and the chosen items too. We have also exposed methods to manipulate these values. Now, lets look at the code that updates the UI. 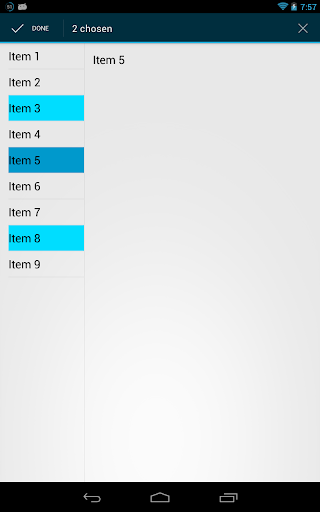 It is rather simple - all we need to do is, set the background of the row view depending on the opened and chosen states of the current item. Note that an item can be both opened and chosen. In your Activity or Fragment, we listen for both clicks and long clicks and update the adapter accordingly. Again, only the relevant portions of the code are presented here - the full project is shared on github (linked at the end of this post). Here we use a ListAdapter that also implements OnItemLongClickListener. The previous code snippet also includes step 4 from our high level overview. If the CAB is not already shown, we show it when an item is long clicked. That mostly covers what we need to do to achieve our goal. There are a few other things that need to be taken care of (for example, clearing the choices whenever the CAB is dismissed - as a result of a contextual action being performed, or otherwise). You can examine the entire code in detail at the github repository. The old GMail app (v4.3) displayed check boxes for each row. So you could choose an item either by long-pressing it, or by tapping the check box. In the new GMail app and the Google I/O 2013 app, when no item is chosen, you long-press an item to choose it. After that, even single clicking on other items chooses them. This is different from our implementation where a single-tap always opens an item. You will need to modify the code for the click listeners if you want to go with one of these variations. The ListAdapter code itself should remain the same. Turning this into a library? If anyone has any ideas on how this could be library-ized, please do drop a comment. The complete source code for this article is available as a sample project on GitHub here. The content of this post may seem ... well .. trivial at first, but I have tripped over these so many times that I decided to write it up - at least to keep me reminded of it, if not for any other reason! However, I quickly found out that often it is not possible to cleanly define these keys as belonging to a particular class. Further, since you might end up with a handful of extras, qualifying the class name becomes tedious - more so since it is likely that Activities or Services can have quite long names. How readable is this snippet? One common solution to this problem is to put everything into one "God" object called Constants or whatever, and prefix the constant names with EXTRA_, ACTION_ or other such descriptive characters to keep them distinct. Now, we've solved the readability problem since we just qualify the constant names with Constant. So, all's well, right? The problem with this approach is as the number of extras, actions and preference keys increases, the Constants class quickly becomes unmanageable. Also, having to use the ACTION_ and EXTRA_ prefixes hinders usability with some IDE's. For example, with Eclipse, even if you know that you want EXTRA_LIVE_UPDATE_TIMESTAMP, you are forced to type the first six characters without which the code assist will not be able to filter only the extras. Try using Eclipse to find a particular action or extra from the Intent class if you want to see a real-world example of what I mean. return Constants.NAMESPACE_PREFIX + ".extra. "+suffix; //NAMESPACE_PREFIX could be "com.myawesomeapp"
return Constants.NAMESPACE_PREFIX + ".broadcast. "+suffix; //NAMESPACE_PREFIX could be "com.myawesomeapp"
return Constants.NAMESPACE_PREFIX + ".action. "+suffix; //NAMESPACE_PREFIX could be "com.myawesomeapp"
Which code snippet would your rather see, especially six months from now when you have to fix a bug? Also note that we've made it far more easy to find the exact action or extra that we want using our IDEs. Wait, what about constants in XMLs? Glad you asked. In android, many of these constants are used not only in Java code, but also from XML files. Preference keys can be referenced in preferences XML files via the <PreferenceScreen> element. Intents can be declared in AndroidManifest.xml. This means, the Intent action and categories can be referenced from the manifest. BroadcastReceivers can be declared in AndroidManifest.xml. The <intent-filter> action and categories are referenced here. This is not good. Any change to any constant involves updating it at multiple places. What's more, these issues are not caught at compile time and can be hard to debug. One way to avoid constant literal duplication issue explained in the previous section is to use string resources. You are already using string resources for a variety of strings in your Android app. (Wait, you aren't? I strongly suggest you start doing so right now). All you need to do is add the constants as additional string resources. Unfortunately, this solution has all the disadvantages I mentioned in an earlier section. Your constants.xml will quickly become a monolithic clutter. This can be addressed by creating a separate XML file for each type of constant - like broadcasts.xml, pref_keys.xml etc. Even if you do that, you will still be accessing all the resources using @string/blah and R.string.blah. Also, IDE content assist is still a problem. Your resource names will need to be prefixed with action_ or broadcast_ or pref_key_ etc and finding the key you need could be frustrating. For preference keys, prefer string resources. This is because you are most likely to be building your Settings screens with XML anyway. For all other key constants, prefer split constant files. Only if you need to use these from XML, declare them as string resources.